EVENT IS RAIN OR SHINE. NO REFUNDS. NO EXCEPTIONS. *Your email confirmation is NOT your ticket. You must bring your ticket confirmation and photo ID to Will Call to pick up your ticket(s). 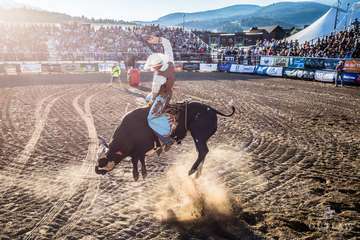 VIP $154.50: VIP tickets include access to PBR bull riding from 6:00-8:30pm, first-come, first-serve preferred seating including mix of bleachers and upper deck with tables, behind-the-chute access, selection of light snacks, alcoholic and non-alcoholic beverages, and catered buffet in cowboy tent. General Admission $51.50: General Admission tickets are $51.50 for adults and children ages 3 and up. Children 2 years and under free of charge: Children 2 years and under, on a lap, are not required to have tickets. Golden Buckle $257.50: Golden Buckle tickets include seating with some of the best views in the house, access to behind the chute viewing platforms, as well as catered food and drinks before the event. Golden Buckle ticket holders will also have ability to participate in the Calcutta Charity Auction held at 5:30pm nightly. The Golden Buckle + Cowboy Sponsor Angel Package $1030.00: includes two quantity Golden Buckle VIP tickets for Friday July 28, and sponsors one PBR cowboy. $500 of this package will sponsor a rider's entry into the Big Sky PBR event, their PBR registration, insurance, and fees. Your purchase of this package will help a hard working cowboy be able to afford coming to our Big Sky event while you get to enjoy the luxuries of the Golden Buckle hospitality tent and seating. You will be paired with one cowboy and your family name or business name will also be listed as this cowboy's sponsor on the day sheets. Skybox Package: Call Outlaw Partners at 406-995-2055 for more information and availability to purchase a Skybox Sponsor Package. The Skybox Package includes a private shaded skybox for 25 people, including 25 qty one-night Skybox VIP tickets. Limited availability. Note: PBR tickets for each night include access to that night's after party concert. Music-only tickets will be available for sale online and at the venue once PBR tickets sell out. All PBR tickets are first come, first serve bleacher seating. No refunds or transfers on ticket sales.